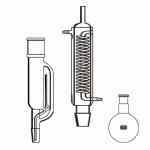 Soxhlet type extraction kit used for continuous extraction of solids with a suitable solvent. 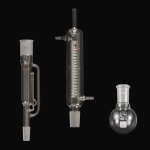 Complete apparatus consists of a jacketed reflux condenser, extractor and round bottom flask. Round bottom flask, capacity 100mL, 24/40 joint. Extractor details: 50mL capacity, 34/45 top outer, 24/40 lower inner joints. Condenser details: 34/45 lower inner joint. Round bottom flask, capacity 250mL, 24/40 joint. Extractor details: 38mm ID, 85mL capacity, 45/50 top outer, 24/40 lower inner joints. 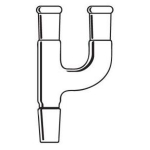 Condenser details: 45/50 lower inner joint, length between hose connections 200mm, overall length 3950mm, body OD 55mm, jacket OD 38mm, coil OD 5mm.